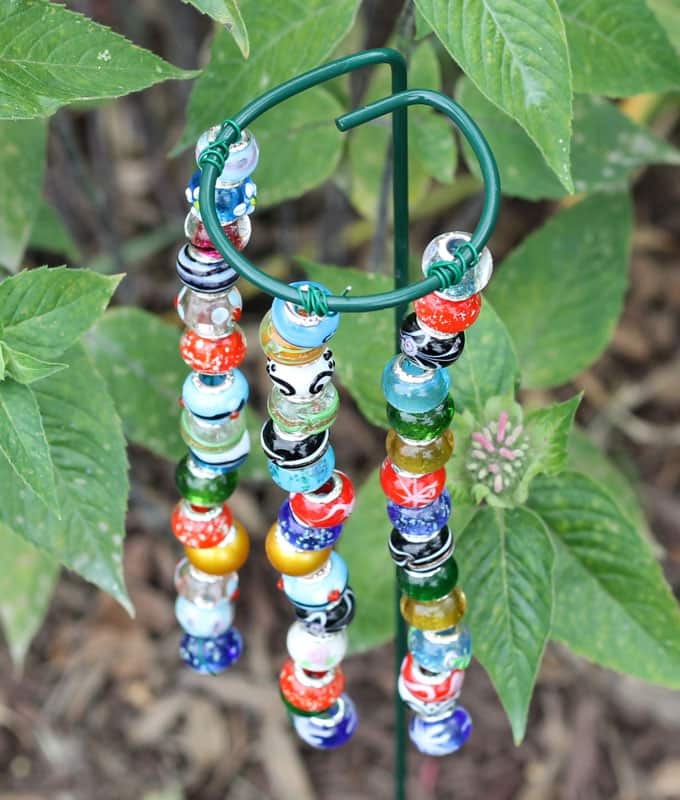 How to make your own beaded garden stakes for your yard. 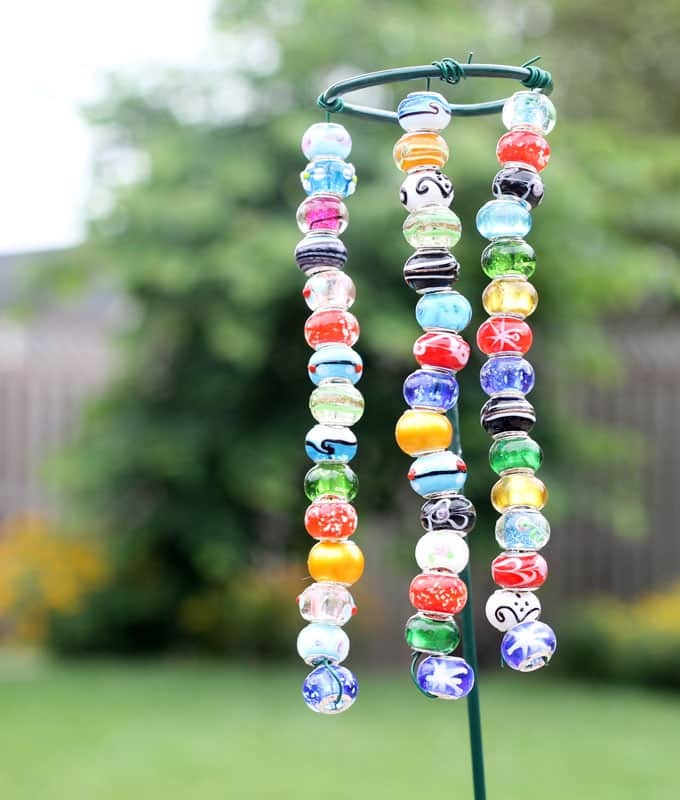 These easy beaded garden stakes are kid-friendly, budget-friendly, and super-easy to make, but they add such a beautiful accent to your garden or yard. Kids want to help? Once you start a bead on a wire, the kids can do the rest themselves. Love color? 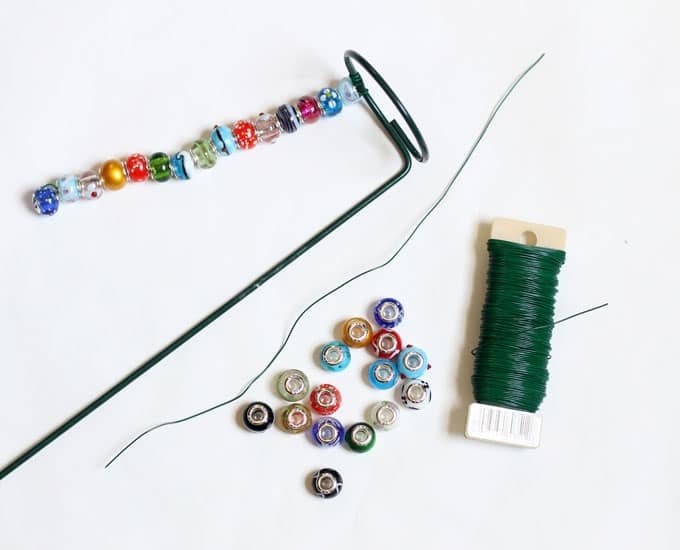 Make the strings of beads even longer and more plentiful. 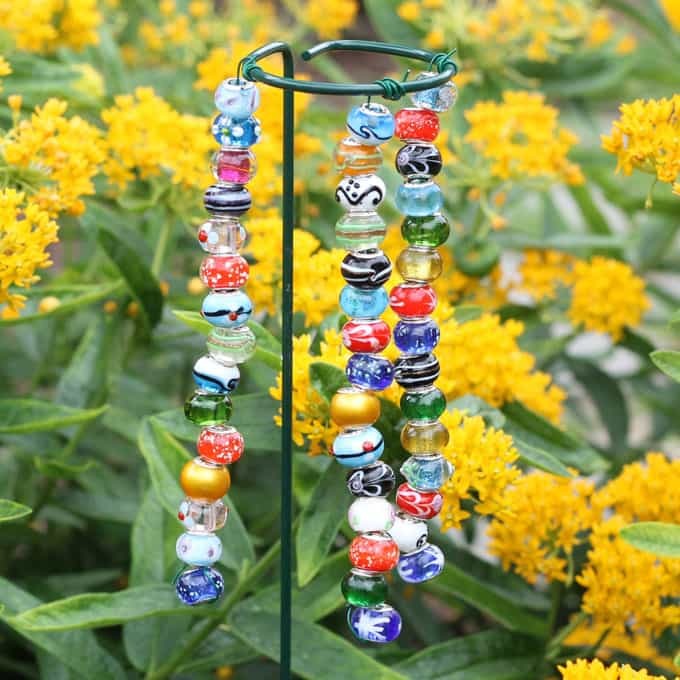 You can also choose one color of bead per plant prop and make a rainbow trail through your garden or along your front walk. 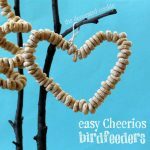 Need another idea for outdoor crafts? Check out this roundup of rock painting ideas. 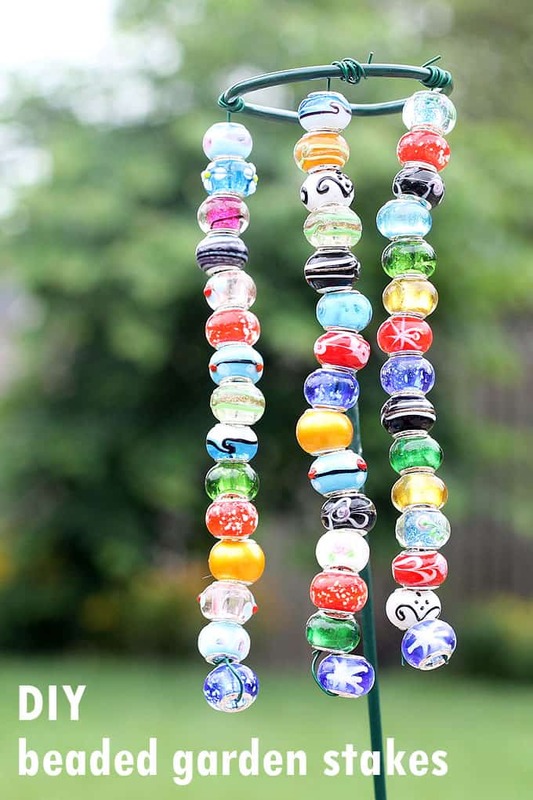 You only need a few supplies to make these beaded garden stakes. Grab an inexpensive plant prop and some green plant wire from a garden supply store. 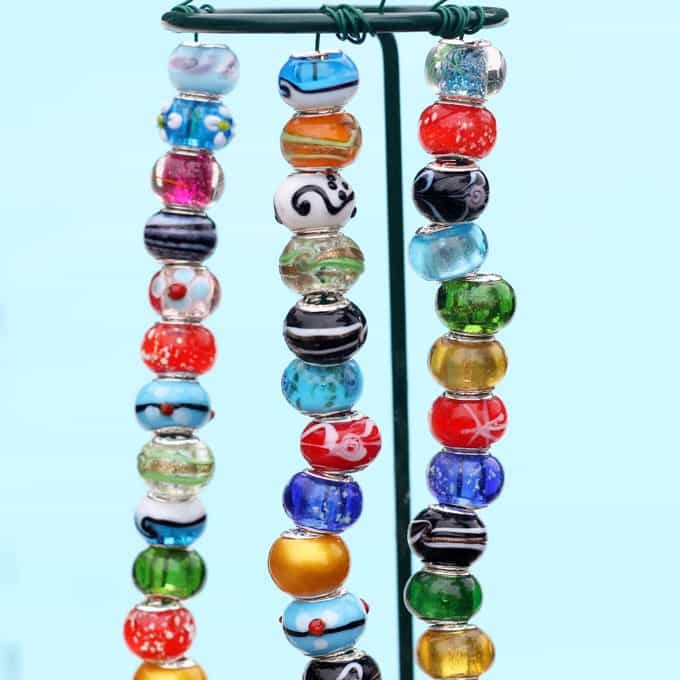 To save on the beads, try heading to the craft store for sales on colorful, glass beads, or search the internet for bulk discounts. You’ll also need scissors that can cut the wire, but some wire comes with a built-in cutter if you don’t already own proper scissors. Snip a piece of wire 10-inches long (or any comparable length you prefer). Wrap one end securely around a glass bead. Thread glass beads 6 to 6 1/2-inches along the wire. Wrap the remaining wire around the circular top of the plant prop. Dangle at least three beaded wires for each plant prop. TIPS: Make the beaded wires longer or add more per plant prop for a more colorful look. 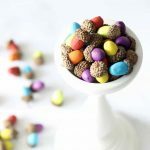 For even more possibilities, head to a specialty bead store and find beads in the shapes of animals, characters, cupcakes, other types of food, and even emojis. 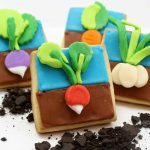 Push into the ground to display! I love, love, love my beaded garden ornaments. I think these will be my version of the pink flamingo for many years to come. 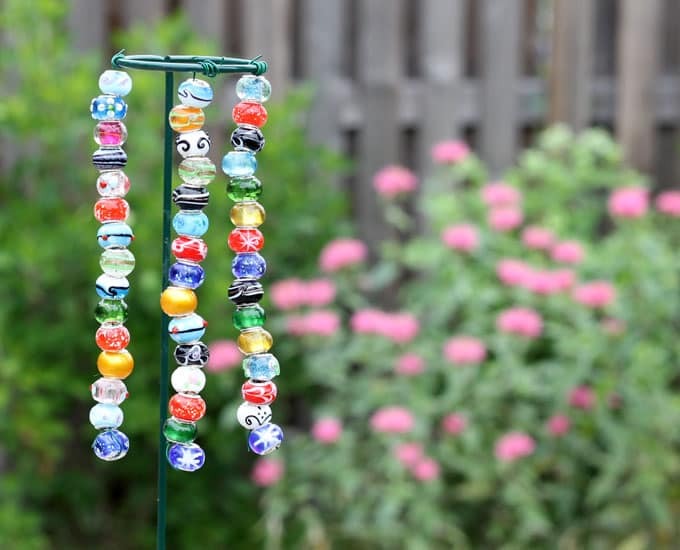 This post for easy beaded garden stakes also appears on Crafts by Amanda. 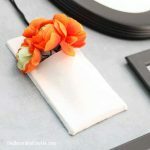 What a cute and lovely idea and great way to add a bit more color to potted plants or just to put along a sidewalk, etc. Relaxing project to do indoors when it’s too hot to work outside. Thank you Colleen!! Love the idea of along the sidewalk and for Christmas trees! One of ours is in a plain, green potted plant on the porch, and it adds just the right amount of color.